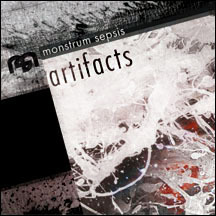 Monstrum Sepsis returns with their third full length release on WTII titled Artifacts. As with 2005's Movement, Artifacts follows the Monstrum Sepsis formula by blending layers of synths over waves of pulsating and pounding percussion. Unlike most bands within the genre, Monstrum Sepsis places a heavy emphasis on melody and structure. The signature Monstrum Sepsis sound is evident from the opening bars of "Smoke 'em," to the powerful undertones in "Glimpse" and carries through to the harmonious "Wit's End Persistence." In addition to the sonic soundscapes, Artifacts spices things up with some politically charged samples that reflect the current world moods and trends. These political affairs are exposed in the thought provoking and intelligent tracks "Opus Dictum," "Squelch" and "War of Ideas." Overall, Artifacts is a solid release that will take the listeners on an aural journey of substance and significance.